Platform independent Optical Character Recognition engine that can read text from images. No software download required. It is easy to get started with Aspose.OCR Cloud for cURL and there is nothing to install. Simply create an account at Aspose for Cloud and get your application information. Once you have the App SID & key, you are ready to give a try to Aspose.OCR Cloud for cURL using any language - on any platform, which supports HTTP requests and responses. So in simple words, it enables you to add OCR functionality to any type of applications.  Aspose.OCR Cloud for cURL provides optical character recognition and documents scanning capabilities in the cloud. It supports reading and recognizing characters from most commonly used raster image formats. 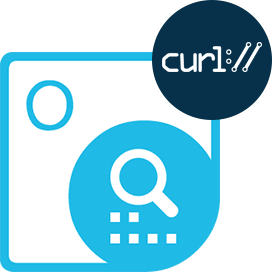 Just pass specific image name and its format to the Aspose.OCR Cloud for cURL and it will return a response in XML or JSON format including recognized text, font name, font size, font style. Use our product to energize service delivery by speeding up the deployment of advanced services through a flexible software-based model with proven scalability and a supercharged integration. Aspose.OCR Cloud for cURL - some of supported languages and platforms. Aspose.OCR Cloud for cURL supports most commonly used image formats to read and recognize characters from. An overview of the capabilities of Aspose.OCR Cloud for cURL. Optical character recognition can be performed either on a whole image or on a specific portion of the image. If the required characters are all over the image then scanning the whole image is better option. If you want to scan partial image then specify a rectangular area containing the characters. Aspose.OCR Cloud for cURL allows passing X and Y coordinates from where the rectangle is supposed to be started as well as its width and height. Once the character recognition operation is initiated within specified rectangular area, the cloud OCR SDK will read the characters and font information from that area and return the response in XML or JSON format. The characters of different languages have different representations. If we combine the languages with the font types and styles - it makes a large set of characters to be recognized from an image. Aspose.OCR Cloud for cURL handles this task very elegantly as it can recognize text in English, French and Spanish languages. When talking about specific fonts, this API is capable of extracting text in Arial, Times New Roman, Courier New, Verdana, Tahoma and Calibri fonts with regular, bold or italic styles from images. Aspose.OCR Cloud for cURL can be used with any language or platform which supports HTTP requests and responses. You can also use Aspose.OCR Cloud for cURL with many third party storage providers including Amazon S3, Google Cloud, Google Drive and Dropbox. Why Aspose.OCR Cloud for cURL ?